This has been very widely accepted by our Fine Dining Restaurant customers. The Tablet version works along with main station and is a great tool for the servers to book the table, take order, modify or add item. A single server can simultaneously take care of many table which results in increased performance and good customer experience. Our Software facilitates users to create flexible table layout for multiple floors. This further expedites the order management process for servers. Billing, the origin of revenues, is the most crucial part of the restaurant business. Hence, utmost care must be taken to guard against billing disasters at restaurants. Our billing module not only automates the process but helps minimize billing nightmares such as inaccurate calculation, missed entries, deletion of registries etc. and improves customer experience. Often a large group of customers wishes to divide the entire bills to pay for their individual shares and ask for separate bills. Splitting bills manually is extremely time consuming and can be prone to miscalculation and other mistakes. To overcome this situation, we introduced split bill module. This module generates separate bills, upon request, in three ways. Item split: Item Split allows customers to split and pay their bill on the basis of ITEMS ordered. This is usually required when customer order food, beverages and bar items. Custom split: Under this option, EACH item can be split amongst ANY number of guests giving full flexibility to customize their bill. 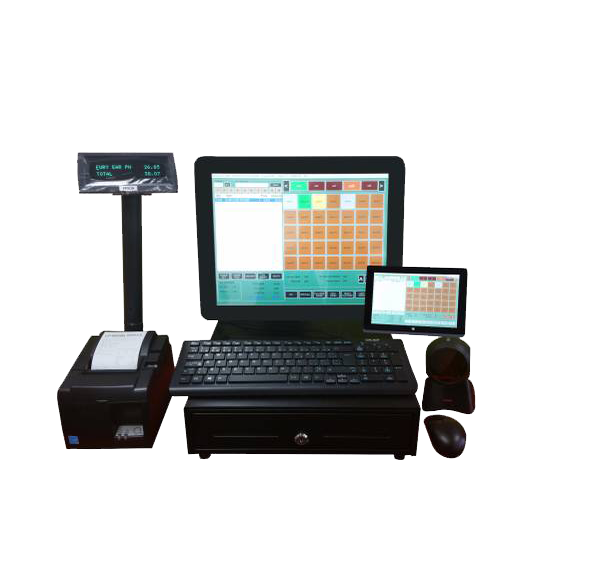 Each item is linked to respective kitchen or Bar printer and once an order is placed, is served quickly through the related printer eliminating coordination requirement and thus creating a refined system in place ruling out any communication gaps amongst the staff. Integrated Caller ID helps to build data base for each customer which results in serving them quickly. The same data base can be used to serve them in near future or to share business promotions etc. Business can call back customers in case of missed call during peak business hours or week end resulting into customer appreciation and business growth. System has facility to add service charge on dine in orders. DMEasyBiz offers Dine In option with table layout for single or multiple floor level and can assign separate prices for Dine-In to include other infrastructure costs. Pamper your guests with great food and perfect services to make their visit memorable while our POS system takes care of the rest of the activities. Take out option helps to serve people on the move. Customers save time while enjoying their favorite pick. Quickly serving customers is the mantra here. DMEasyBiz offers take out as an independent option and the business can maintain same or special prices for Take Out. Customer can order their favorite food during week days or while enjoying with the family or friends and get it delivered at desired neighborhood very fast. System is capable of recording customer details including name, address, contact number and calculate fixed delivery charges or based on area zip code as required by business. Previous order history along with editing option helps to place the orders quickly leading to faster delivery. A driver module further facilitates the delivery process and accountability. On the Go Debit/Credit options can close the orders upon final payment. Give your customers the luxury of reserving their table to avoid waiting during busy weekends. Dining experience can further be improvised by experienced servers who can take orders right at the table itself using Tablets for a quick order processing, faster service and great customer experience leading to a enhanced Time Management. From a Standalone POS system to an all-in-one business management system, our solutions enable restaurants to offer rapid, flexible and high-quality service, making table and guest management easy and helping you to add up to numbers of satisfied customers. Starting with taking orders from guests, managing special orders, sharing accurate information with the kitchen or bar and serving the right order requires all the departments to work in a perfect scenario. Our POS covers all these aspects so that you can concentrate on quality of food and service. Once a customer is finished with their favorite meal, the next step goes towards payment and gratitude for excellent food and service. The customer has the option to pay through cash or Debit/Credit Card. 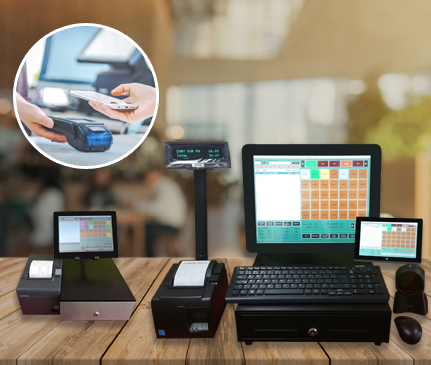 POS is integrated with major payment terminals is integrated with many debit machines which also offer an option to pay at customer table and the POS closes the order upon full payment. 1. Caller ID integration: Caller ID facilitates faster order processing, captures customer data for placing fresh order, reduces data entry errors, facilitates return call for missed calls, shows old order history which can be used for subsequent Take Away or Delivery orders. 2. Deals: Deals can be custom built for each business offering discount for multiple quantity, charging extra for customization or special add-on to synchronize with the menu card. 3.Delivery Charges: The system offers charging a flat delivery charge OR based on distance from the business as required. 4.Driver Module: This module helps delivery drivers to select open orders for a preferred route. The balance open orders can be picked by other delivery drivers. All delivered orders can be closed by delivery drivers once payment details are punched which forms base for many reports, analysis and payout.